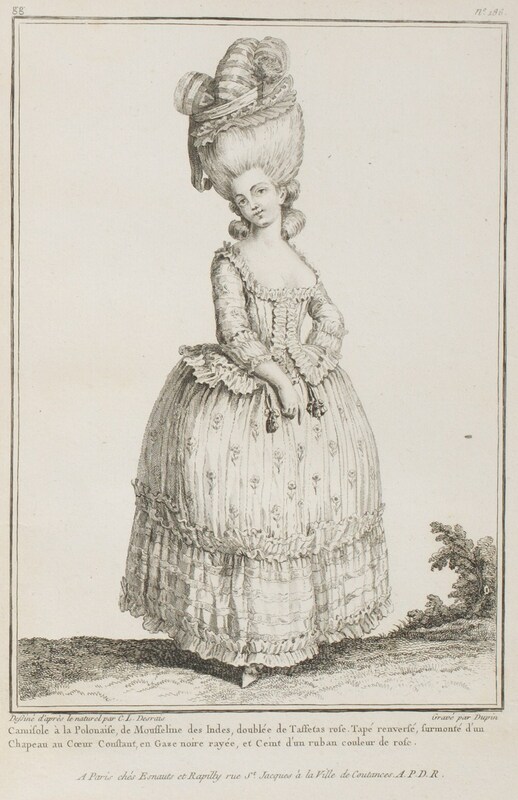 CAMISOLE A LA POLONAISE. The camisole was, in the past, nightwear for Women. The open Gowns, that are worn at present in the fullest dress, were what one called deshabillés: they were named Robes de chambre. 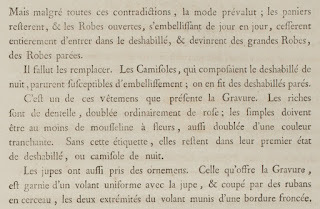 * It is true that they were without trimming, but as they were, they were never seen outside, and made the pendant of the Robes de chambre or Men's deshabillé of which we spoke in the previous article. 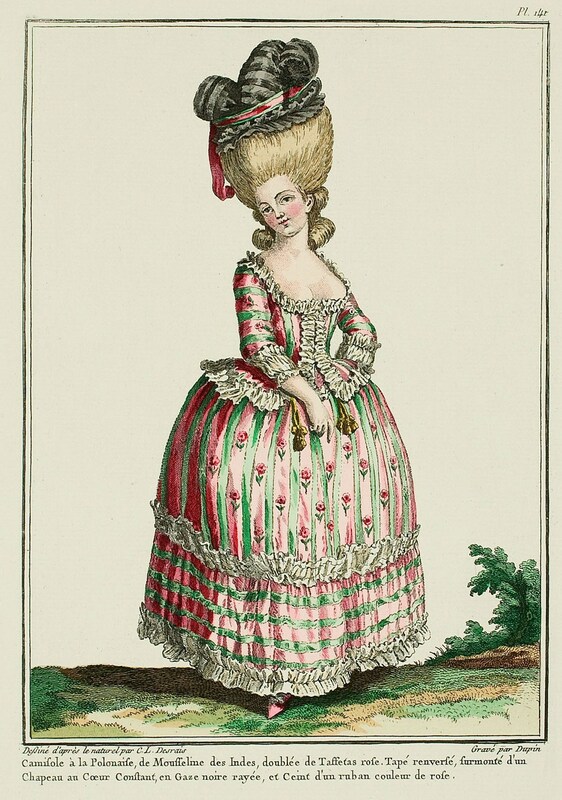 It was under the Regency of the Duke d'Orléans that these Gowns took flight, and were shown in public. The first were worn to the Tuileries, where the young Monarch resided, and this novelty experienced singular contradictions. The Cardinal de Noailles was then Archbishop of Paris. He attempted to prevent the fashion of the new Gowns, or open Gowns, which were represented as scandalous. 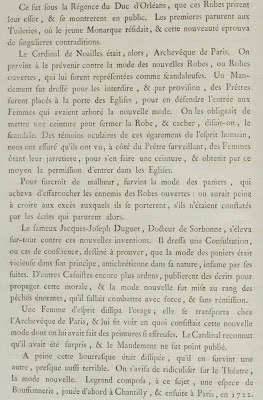 A Command was made to forbid them, and by provision, the Priests were placed at the Church doors to prevent the entry of the Women who sported the new fashion. They were obliged to put on a belt to close the Gown and conceal, it was said, the scandal. As eyewitnesses to these distractions of the human spirit, we are assured that they saw, next to the watching Priest, Women removing their garter to use it as a belt and by this means obtain permission to enter Churches. To make matters worse, following the fashion of hoops, which managed to frighten away the enemies of the open Gowns: it would be hard to believe the excess to which they were worn, if they were not noted in the writings which then appeared. 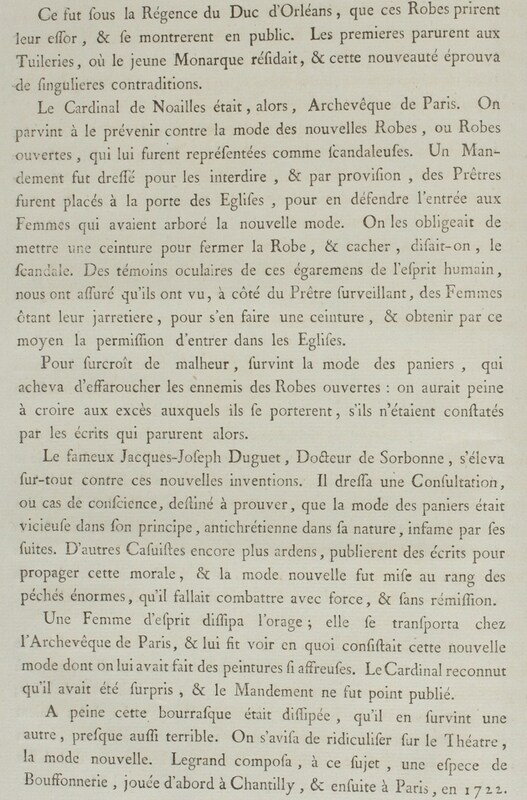 The famous Jacques-Joseph Duguet, Doctor of Sorbonne, raised himself overall against these new inventions. He drew up a Consultation, or case of conscience, intended to prove that the fashion of hoops was vicious in its principle, anti-christian in its nature, and infamous by its followers. Other Casuists still more ardent published writings to propagate this morality, and the new fashion was placed in the rank of great sins which it was necessary to oppose with force and without ceasing. A Woman of spirit dissipated the storm; she transported herself to the home of the Archbishop of Paris, and made him see what this new fashion was, which had made to him such frightening pictures. The Cardinal recognized that he had been misled, and the Command was never published. This squall was scarcely dissipated when another occurred, almost as terrible. One ventured to ridicule the new fashion in the Theatre. 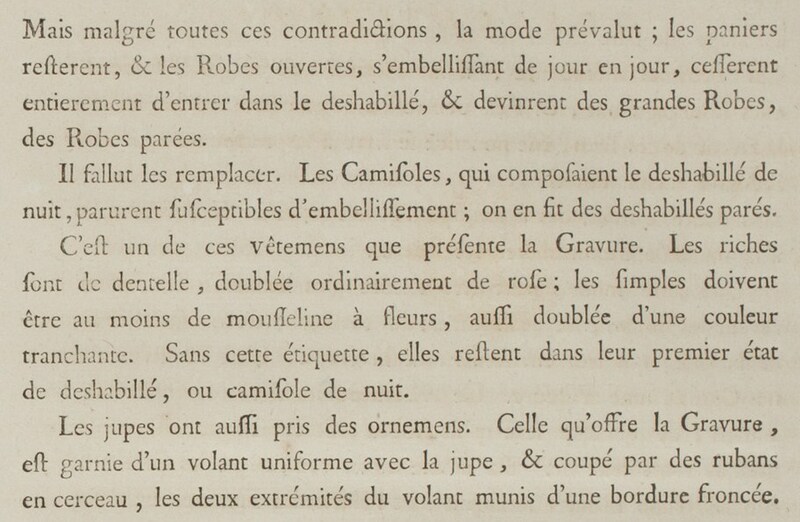 Legrand composed a type of Buffoonery on this subject, played first in Chantilly, and then in Paris, in 1722. But despite all these contradictions, fashion prevailed; the hoops stayed, and the open Gowns, embellishing from day to day, ceasing entirely to be deshabillé and becoming the grand Gowns, the Robes parées. They had to be replaced. Camisoles, which made the night deshabillé, became susceptible to embellishment; they were made as deshabillés parés. It is one of these garments that is presented in the Print. The rich ones are made of lace, ordinarily lined with pink; the simple ones must be at least of flowered muslin, also lined with a contrasting color. Without this etiquette, they remain in their first state of deshabillé, or are a night camisole. The petticoats also have taken ornaments. That shown in the Print is trimmed with a volant matching the petticoat, and cut by parallel ribbons, the two edges of the volant with a gathered border. * These "open gowns" are evidently what we call robes battantes/volantes; I think they're perceived as the same as sacques, just an older version, rather than having their own name.